I recently wrote an article for Streaming Media where I tested AV1 playback from YouTube in Chrome. I mentioned that I couldn’t make Firefox Nightly work, though it also should play the YouTube content. Some folks from Mozilla got in touch and detailed the steps to make it work. 1. Download Firefox Nightly here. 4. Toggle “Always Prefer AV1” in https://www.youtube.com/testtube. I was rewarded with gorgeous, efficient AV1 playback at up to 1080p. 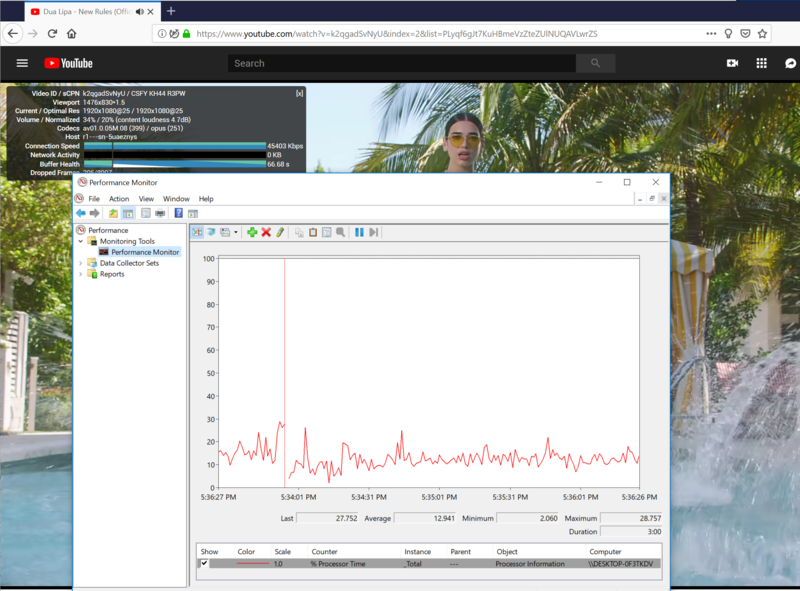 The image below shows Firefox playing 1080p video on my 4-core Zbook notebook at under 20% utilization. In the Streaming Media article, I mentioned that I suffered severe dropped frames with a couple of clips, most notably the Halo trailer. I checked with Firefox and experienced the same problem. I checked several other clips in Firefox and they played fine, just as they did in Chrome. The Halo problems feel like an encoding issue, but that’s just a guess. The bottom line is that AV1 playback is much more efficient than I originally measured. As I mentioned in the Streaming Media article, AV1 encoding has apparently gotten a lot faster as well, now down to 40x VP9 (from over 1,000). Still waiting to see how AV1quality compares to HEVC when deployed at scale; hopefully, that will be soon now that we know playback requirements are reasonable.